Last weekend, the hubby and I were joined by Mame and our balikbayan relative Ate Laura in Bacoor. We drove to our house on Saturday morning with a stop over at S&R Baclaran for a quick lunch and eventually, some grocery shopping. On Sunday, we woke up early to hear the morning mass and make a surprise visit to my uncle in Dasmariñas. Then we went up to Tagaytay and Alfonso. In Tagaytay, we took Ate Laura to Mushroomburger for snacks because she’s a health buff, haha. (Next time, we’ll take her to Sonya’s Garden!) In Alfonso, we checked out The Gingerbread House and visited this foreclosed property that I have recently spotted on the website of a local bank. Naisip ko lang kasi baka kayanin ko nang tuparin ang farm house dream ko, chos! For the first weekend of 2018, I spent some quality bonding time with my two godchildren, my two kumares, and their extended family in our Bacoor home. I prepared a simple lunch for them on Sunday and made chikahan to the max with them. Namiss namin ng sobra ang isa’t-isa, hahaha. I asked Mame to join us for the weekend so she could also entertain my guests. (She gets along with them as much as I do.) The hubby and I, along with Mame, drove home in Bacoor on Saturday afternoon. We dropped by S&R Baclaran to buy some ingredients and of course, to get the chocolate cake that I was raving about last New Year weekend. As I had expected, it was a hit with my guests. Last weekend flew by swiftly. The hubby and I drove to Bacoor on Friday night with a stop over at S&R Baclaran to buy supplies. We would then spend the entire Saturday and most of Sunday at home. We only went out when we heard the mass on Sunday morning and bought some more supplies at the Robinsons supermarket near our village. These past weekends, we’ve been hooked on our smart TV. (We use it alternately: he browses Netflix while I turn to this cool site online for my movie fix; when I’m in front of the TV, he’s with our iPad and vice versa.) I also started crocheting again because I noticed that my yarn supplies were already collecting dust under the bed where I placed them, haha. I hope to finish my new crochet project (using a stitch I just learned) in the coming weeks. Last weekend started and ended just right for the hubby and me. On Friday night, we met up with the hubby’s high school barkada who are now part of my circle of friends as well. 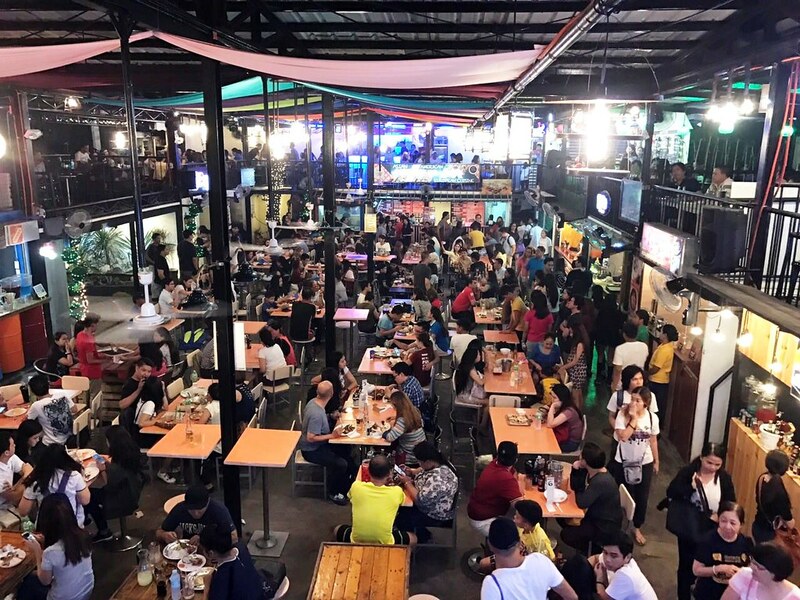 We hung out at Borderline Food Park (BFP) in Mandaluyong City. The place was teeming with youthful vibe that, for a few hours of chatter and laughter, we felt like we were in our 20’s. If you are in the mood for food or want some clean fun with cool music, then this is the place to go.